The Federal Period in America saw the development of unique and distinctive regional characteristics in many forms of furniture. High style furniture made in Portsmouth, New Hampshire exhibited specific and unique inlay and veneer patterns, and the best of those forms have become highly prized among today’s collectors. The "twelve panel" swell front chest with a "drop panel" is one of the most notable of those desirable forms. Only a handful are known, and each one to be discovered has commanded a high price in the marketplace. of the tops and the base just above the apron and feet. The distinctive thirteenth panel centered in the apron is the final signature of the form. The flaring french feet have have a distinctive shape unique to Portsmouth. Our American Federal Classics ™ replica Portsmouth chest is a faithful and exact copy of a rare original drop panel chest which sold for a record price at public auction. 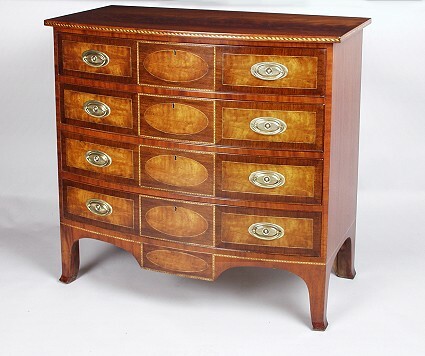 It is made of select Honduras mahogany and features a richly figured mahogany veneered top with inlaid edge, above four drawers with two rectangular panels and a central oval panel, raised on a base with conforming oval drop panel and flaring french feet. The dynamic proportions are complemented with a hand rubbed natural shellac finish which completes a striking and exquisite piece.